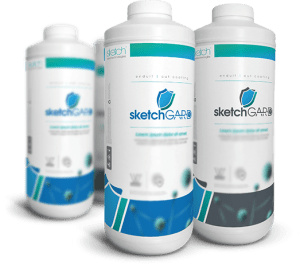 SketchNanoGard Thermal – SC, SP or HC Formula – is a thermal insulation liquid coating for windows that blocks ultraviolet (UV) and infrared rays (IRs), while maintaining visible light transmission. This eco-energetic solution means that a window can receive a maximum of natural light while reducing indoor temperatures by 3°C to 5°C in the summer, for example. The result: a notable reduction in energy costs while offering greater comfort. Expect similar savings in the winter, since our thermal barrier prevents heat from escaping through windows. Who can use our product? Just about every type of business or institution — industrial parks, hotels, car dealerships, office towers, multi-unit housing, hospitals, etc. We are currently working on the finalization of a solution for residential use. Stay tuned for more developments! Contact us to learn more about our products and how they can help you lower your energy costs! SketchNanoGard Thermal reduces climatic impact and minimally affects window transparency. Less ultraviolet rays, less infrareds, less condensation. ROIC of 3 to 4 years*. No damage, no smearing, and no spots. Our coating is applied with painting rollers by Sketch-certified professionals who will leave no trace behind.